After spending approximately 26 hours in the car from Saturday – Tuesday, we were relieved to pull into Ely mid-afternoon on New Year’s Eve and not have to worry about driving anywhere far for a few days. Everybody gathered at Tara’s dad’s house, as I mentioned previously, and we had a great time eating pizza, drinking booze, and swapping stories. We made our way to Rack’s in downtown Ely for more drinks and camaraderie, then over to the Bristlecone Convention Center around 11:30 to count down the waning minutes of 2013. At the stroke of midnight Tara and I were on the dance floor, drinks in hand, and as dozens of balloons dropped, we kissed each other to welcome in the new year. It was a serious case of deja vu, as we’d done the exact same thing two years earlier. And look how far we’ve come since then! This time we ended up in bed about 2:30, a little earlier than last time. I guess this means we’re getting old now. Wednesday was the big, annual New Year’s Day party at Tara’s uncle Ward’s house. Fortunately, this is a mere two blocks from her dad’s house, and didn’t start until 2 PM. So we were able to have a relaxing morning and sober up from the night before, before turning around and drinking some more. We brought a little taste of the city to small town America, setting up a Portland-style Bloody Mary bar complete with all the fixin’s, including bacon. You should have seen the looks on some of those Ely guys’ faces when we put strips of smoked meat in our drinks. They probably think we city folk are downright goofy. The party was fun, though it was pretty crowded in Ward’s smallish ranch house, which meant it was loud and warm. But the food was excellent, in particular the grilled bluefin tuna and venison. Most interesting of all, we ate ibex. This animal is a species of mountain goat with long, curved horns…and was pretty tasty. A little gamy, but richly flavored red meat similar to lamb or perhaps bison. Ward (and most of Tara’s family, as a matter of fact) hunts, and was proud of this particular kill. Apparently, based on the cost of hunting the animal and collecting the meat, it cost about $1000 a pound when all was said and done. I’ve always had an adventurous palate, and couldn’t resist trying it. And of course, I made sure to have a bowl of black-eyed peas for good luck. The party broke up about 7 PM – for us, at least – and we kicked back and watched The Twilight Zone New Year’s marathon for a while before heading to bed early. (William Shatner’s monster-on-an-airplane-wing and Talky Tina: score! Two of my favorite episodes). Thursday we hung around town and took care of some business. We zipped over to Ruth to check on Tara’s now-abandoned house, which her former tenants ended up trashing before skipping out on her owing some $3800 in back rent alone, plus damages. She’ll be taking them to court, and it should be an open-and-shut case. Plus, we found out where they secretly moved to: right next door. Ha. Dumbasses. Anyway, we ended up making dinner for Tara’s dad and a bunch of others who ended up stopping by. Her mom’s famous chicken soup with homemade noodles. It was all fantastic, though the evening did erupt into a great, big politically charged argument that I am going to discuss in my next blog post – stay tuned folks, it’ll be a good one! That unpleasantness aside, Tara and I ended up taking a drive into the middle of nowhere (which translates to approximately 7 minutes west of town) to catch the stars. It’s become a tradition of sorts with us, and is always breathtakingly beautiful. I have never seen so many stars in my life! This morning, we packed up our stuff, and drove three hours to Elko, traversing Secret Pass and the beautiful snow-packed Ruby Mountains. The scenery was amazing. We grabbed lunch at a favorite bar and grill of Tara’s, visited with her aunt for a couple of hours, and then with her cousin and his family. We ended up at Dos Amigos for a delicious Mexican dinner, then checked into a motel in preparation for our drive home tomorrow. We’re planning on hitting the road about 6 AM for the loooong drive home. As great as this vacation has been – and it truly has been – I am far more homesick than I ever imagined I’d be. This is the longest I’ve been away from home since 2011, and I miss my liberal little enclave in the upper left corner of the country in a bad way. I wanna go back where it’s gray and green and the protest songs have tambourines. Ruby Mountains from Butte Valley. Great! Now i won’t be satisfied until I try ibex! Where the heck does one hunt ibex? 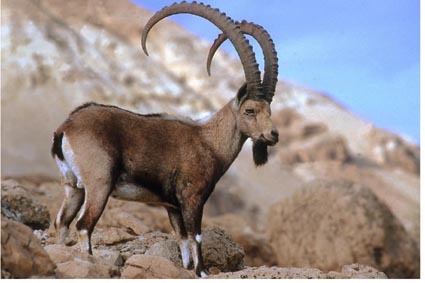 According to Wikipedia, there are different species (nubine ibex, alpine ibex, etc.) and they are located everywhere from Africa to the U.S. This uncle got his in New Mexico. Yummy! Mark, GREAT part 2 recap post, buddy! I felt like I was there with you and Tara! OH. MY. GOD. Without a doubt, those are my two favorites episodes as well – especially Talking Tiny! That doll gives me the total creeps! Great photos! The one of Ruby Mountains is spectacular! Have a safe trip home, buddy! The only one missing was the episode where Anthony makes people disappear into the cornfield. That would have made it the perfect TZ Trifecta. We’re back home safe and sound. Enjoy the rest of your weekend, Ron! Happy New Year you two! Beautiful photos and sounds like you had a great time ringing in the new year, apart from the trashed house and rent due. Hope all works out and that you have an amazing road trip!! So happy that you are having fun. I’ll be just as glad when you two get home. Washington isn’t the same without you in it. Aww…thanks, mom! We do kind of put the ASH in Washington. Or maybe it’s the NGTO? Either way – there’s no place like home!! Thanks for stopping by and letting me know, Dianne! Our waterfalls freeze up like that once every few years. Even pictures don’t really do them justice! Sounds like you were very busy! This is one of the problems with absentee landlords, the tenants take advantage! I had the same thing happen to me when we first moved to Pickle Lake & I hadn’t sold my house in Winnipeg yet. Not only did they trash my house, they stole the wall to wall carpet! Yeah, we’ve realized it’s almost impossible to be a long-distance landlord. Tara dropped the price of the house significantly while we were visiting, so hopefully that’ll generate some interest. Unfortunately, Ruth, NV isn’t exactly a hotbed of activity. Intolerance: What is This, 1957? !